In 1980 ABBA released two albums. Most famous is Super Trouper, released in early November and freely available today on CD and in several box set. And then there was Gracias Por La Música, released in June and today an antique, hard to find relic. Unavailable except as a second-hand LP or CD, if you can find it. The history of Gracias Por La Música goes back to early 1979. In January ABBA had released ‘Chiquitita’, which was roaring up the single charts in many countries. One part of the world where ABBA had not been as successful as elsewhere was South America. 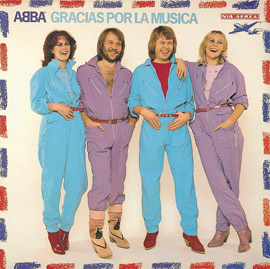 Buddy McCluskey of RCA Argentina, ABBA’s local licensee, suggested to Stig Anderson and ABBA that a Spanish-language version could be a big hit and break ABBA in Latin America. McCluskey and his wife Mary wrote Spanish lyrics, ABBA recorded it, and within months it was topping the charts across the Spanish-speaking world. It was said to be the biggest hit in Argentina for 25 years! Later in the year ABBA recorded a Spanish version of ‘I Have A Dream’ entitled ‘Estoy Soñando’. This too became a hit, and inspired the idea to release an album of Spanish versions of ABBA hits. The ideal time came in January 1980. Benny and Björn were planning a trip to Barbados to inspire their songwriting energies for the next ABBA album. Agnetha and Frida were staying behind in Stockholm. They convened at ABBA engineer Michael B. Tretow’s home studio to record new vocals to eight ABBA songs. The McCluskey’s again wrote the lyrics, and Stockholm-based Spanish journalist Ana de Martinez del Valle assisted with the pronunciation. The selected songs included those with an obvious latin feel or title (such as ‘Fernando’, ‘Move On’ and ‘Hasta Mañana’), recent singles (‘Gimme! Gimme! Gimme!’) and big ABBA hits (‘Mamma Mia’, ‘Dancing Queen’, ‘Knowing Me, Knowing You’). The gamble paid off, and upon release in June the album was a big seller in many South American countries and Spain. It was also a surprise hit in Japan, and saw limited release in the UK, USA, and eventually Australia. Since the advent of the Compact Disc in the early 1980s Gracias Por La Música has not had a widespread release. It was released on CD in Japan in 1986, Argentina in 1993, and a limited US release in 1989. In 1993 PolyGram International released ABBA Oro – Grandes Exitos, a ten track CD which included all the songs from Gracias Por La Música, in a rearranged order. The title and cover fit in with the previous year’s mega-selling ABBA Gold – Greatest Hits. The following year saw the release of ABBA Más Oro – Más ABBA Exitos (More Gold – More ABBA Hits), which compiled ABBA’s five remaining Spanish-language recordings – two songs each from 1980 and 1981, and the Spanish version of ‘Ring Ring’, recorded in 1973 but unreleased until this CD. In 1999 ABBA Oro was re-released with all 15 Spanish recordings. This has since become part of the regular ABBA catalogue. When ABBA’s albums have been re-released in box sets such as The Complete Studio Recordings, and when ABBA’s studio albums have been released as Deluxe Editions, the Spanish recordings have been added as bonus tracks on the appropriate albums. And Gracias Por La Música remains the lost album of the ABBA catalogue, forgotten except to the most ardent ABBA fans who still lament its disappearance. If you sign up at www.powerhousemuseum.com/abbaworld we’ll be sure to keep you updated on the latest news about the exhibition! After stints in London and Melbourne ABBAWORLD is spreading out across the globe, opening at ETO Park in Györ, Hungary on December 4th, and at the Powerhouse Museum in Sydney, Australia on December 17th. ABBAWORLD is the fully interactive ABBA exhibition, endorsed by the four members. It includes original ABBA costumes, recreations of their Polar Music office, studio, backstage dressing room, Björn and Benny’s songwriting hut, gold records, personal items, new interviews with the Frida, Benny, Björn, Agnetha and many of their collaborators, plus interactive features including ABBA sing-along, Dance with ABBA, and the popular Perform with ABBA, where you perform on stage with a 3D hologram version of the group. Visitors can download their interactive experiences afterwards from the ABBAWORLD website. Questions have been asked how the exhibition can be in two cities at the same time. Most of the exhibition is especially constructed – the displays, interactive elements, audio guides, etc. Of the original ABBA artifacts there are enough costumes, gold records, awards, instruments, etc to make a satisfactory display for several simultaneous exhibitions. There were already differences between London and Melbourne. In Melbourne the exhibition covered three floors, which made for a different arrangement to London’s single level. Melbourne had less costumes than London, but added some different ones. Melbourne included more Australian content, including more local gold records, memorabilia, and fan stories. The Hungarian website details the 16 (rather than 25) rooms of the exhibition there. It appears that most of the major elements are there, with some rooms merged together, such as the albums being in one room rather than individual rooms for each. Tickets for ABBAWORLD Györ are on sale now, tickets for ABBAWORLD Sydney go on sale soon. See the website abbaworld.com for full details, links for tickets, and of course the full ABBAWORLD interactive experience. ABBA fans living in Canberra, Australia’s national capital, are lucky enough to have their own weekly ABBA show on community radio station 2XX FM 98.3. Gimme Gimme Gimme is broadcast every Sunday afternoon at 5 pm Australian eastern time (7.00 am GMT March-October, 6.00 am GMT October – March). The show is hosted by ABBA fans Allison, Luke and Jane. Allison started the show in 2004, Jane and then Luke joined her after her original on-air partner Dave moved away from Canberra a few years later. Every week the show features a mix of ABBA hits, lesser known tracks, solo work, other projects and cover versions. The show is subtitled “there is more to ABBA than you think” and every week proves that there is indeed more to ABBA than the hits on ABBA Gold. It’s always fun to hear the banter between the three hosts as they debate the merits (or not) of a particular ABBA song. Some weeks there will be a theme to the show – one recent themed show have focused on songs from the musicals Chess, Kristina and Mamma Mia!, and another on the Eurovision Song Contest, the one day of the year the show will play music that is not directly connected to ABBA. The show also celebrates ABBA milestones such as the member’s birthdays. Every week about half way through there is the latest ABBA news of anything happening in Canberra, but also around Australia and around the world. Of course the biggest ABBA news recently was the opening of ABBAWORLD in Melbourne, and on the following Sunday I chatted with Allison on-air about the opening week’s events. Listeners outside Canberra can listen to live streaming on the internet at http://www.2xxfm.org.au/. Many regular listeners tune in online from around Australia and around the world, including fans from New Zealand, Mexico, The Netherlands and South Africa (just to name a few). The time difference can make it difficult – in the UK it’s early morning while in America it’s after midnight. But it’s worth tuning in to celebrate ABBA! Listeners can get connected on the show’s Facebook page , make requests, comment on the show or just chat about ABBA. The show also has a blog listing all songs available to play. November 1 marks the fortieth anniversary of the first ever on-stage performance by the quartet Björn Ulvaeus, Benny Andersson, Agnetha Fältskog and Anni-Frid Lyngstad. After a couple of years of participating on each other’s records, including the first ever recording to feature all four – especially the Björn and Benny song ”Hej gamle man!’ (Hey, old man) earlier in 1970, which became a big hit in Sweden – they decided to try a stage show together. 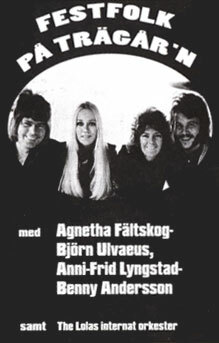 The show opened on November 1 1970 at the restaurant/club Trägår’n in Göteborg (Gothenburg). It moved to the Strand Cabaret in Stockholm in December, and also a short tour in Sweden in January and February. Festfolk has gone down in ABBA history as one of the most famous, or should that be infamous, milestones. As well as being the first time all four performed on stage together, it was a certifiable flop, with the few patrons in the restaurant ignoring the show as they ate and drank the night away. Björn has said in many interviews that this event was when the group learned exactly what not to do, and it would be a long time until the four worked together again. Unfortunately for us fans there are just a handful of photographs recording this event for posterity. Björn has said he’s very happy that there is no recording of the show. ABBA was still long way off in the future. Two years later the group calling themselves Björn & Benny, Agnetha & Anni-Frid would record their first group single ‘People Need Love’. Another year until the first album Ring Ring. And another year after that until the group now called ABBA achieved their international breakthrough with ‘Waterloo’.